This past spring and summer PIT volunteers and National Forest staff classified and verified sections of the Nobles Emigrant Road, Fort Crook Military/Lockhart Wagon Road, and the Yreka Trail during three PIT projects on the Lassen and Klamath National Forests. 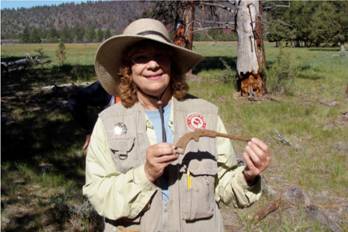 In May, Brenda Reed, Hat Creek District Archaeologist on the Lassen National Forest, directed "Wagon Trails II," a PIT that analyzed artifacts found during the 2009 PIT project of the same name. Artifacts recovered during that project were found on the cutoff between the Nobles Emigrant Road and the Fort Crook Military Road - also known as the Lockhart Wagon Road. Verifying this route was necessary since logging for a fuel break was planned near the general route of the Trail. Putting all the roads in the area into perspective was another goal of the project. Richard and Orsola Silva and Stafford Hazelett completed preliminary work in this area during a two-year study. The fieldwork allowed us to record information about artifacts not previously collected, which included field information such as precise location, important for understanding what happened as people traveled particular segments of the Trail. The lab work we did allowed for more in-depth analysis. The artifacts analyzed during the 2009 project included numerous ox, mule, and horse shoes, wagon related parts, hand forged and cut nails, a coffee grinder, a large cooking pot in many pieces, and a flowered metal button from a lady's garment. When an artifact was found it was photographed and a comprehensive artifact feature form was completed. A description of the artifact, its measurements, and a drawing of it were included, as were any pertinent cultural, environmental and geological resources associated with the find. GPS coordinates, a map datum, and the township, range, and section were logged, along with the crew who found it. Research during the artifact analysis identified and dated the artifacts. Artifact feature forms completed in the field were entered in the computer along with a picture. As a participant in the discovery of the artifacts during the 2009 PIT project, it was fun to reexamine them and learn more about their functions and ages. After three days of working indoors we had the opportunity to spend a day in the field. After trying unsuccessfully to access the Trail segment proposed for the 2010 fieldwork due to lingering snow, Richard Silva led us to a section of the Lockhart branch of the Nobles Wagon Road that had opened in 1855. Fires burned through the area in 2009 and, without the undergrowth, we could clearly see the trail. My husband, Glen, found what Richard described as, "one of the best artifacts [he'd] ever seen" lying right on the ground surface. It was a rough lock: a kind of brake that would keep the back wheels of a wagon from turning so it was literally dragged down the hill. In this PIT project, working on the analysis and cataloging showed me what happened to the artifacts collected in the field the previous summer. This artifact analysis project confirmed the connector between the Old Nobles Pass road and the Military road. 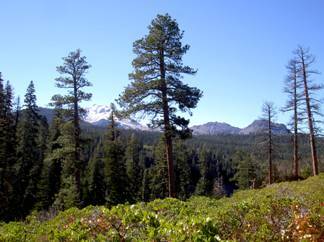 In July, the snow finally melted and "Wagon Trails III," again led by Brenda Reed and Richard and Orsola Silva, began on the Lassen National Forest. We worked on another section of the Nobles Emigrant Road and Fort Crook Military /Lockhart Wagon Road. Here we found mule shoes, many of which could have been military issue. We always like to find oxen shoes when working on an emigrant trail PIT project, although they are usually few and far between. However on this trail, both in 2009 and 2010, there were many, including hand-forged shoes. We also found numerous cut nails, shoe nails, and wagon hardware, along the route. These artifacts verified the emigrant, military, and stage use of this portion of the trail. In 1854, General Land Office surveyor, C. C. Tracy, gave a description of the segments we worked on: "At the point last mentioned I found it impossible to continue my lines regularly in any direction, but was prevented by the high mountain range near Lawson Butte. I therefore commenced a traverse from this point following very nearly the course of a newly projected road leading from Fort Reading to Yreka ….. This route is nearly that of the old Noble Trail……"
This past June, Jeanne Goetz, archaeologist for the Goosenest District on the Klamath National Forest, retired archaeologist John Hitchcock, and Richard and Orsola Silva, led year four of the Yreka Trail PIT Project. 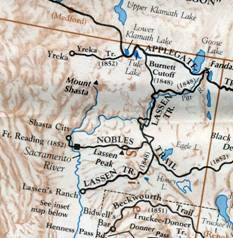 The 2009 project focused on "Jump-Off Joe," the ford of Butte Creek, and Little Lake (Orr Lake). All are known landmarks and date to 1851, before the mapping done by US topographical engineer, Lt. R. S. Williamson. The location of the 1854 ford of Butte Creek had been mapped as an OCTA project many years ago. Locating the ford of the original 1852 Yreka Trail became a goal for the 2010 PIT project. Using the General Land Office field notes, Williamson's maps, and a survey of Butte Valley done in 1864 by A.M. Jones, Richard Silva felt that he had finally found the location of the 1852 Yreka trail ford of Butte Creek, after searching for 18 years. It was our job to verify his findings. The ford at Butte Creek would have been a logical camping spot on the Trail since it was 18 miles over a rocky road beyond the often-mentioned camp at Willow Springs. Working on the northeast side of the creek we found an area with many lead rifle balls and bits of lead that looked they had been made on site. We found other artifacts that indicated a campsite, such as a coffee mill, forks, knives and other wagon related hardware. Later in the week, we focused on the southwest side of the ford and on toward Orr Lake. This side of the creek would also have been a good camping spot - lots of grass for the stock. Digging through grass isn't easy, but as I cut through the turf and pulled out roots, I hit rusty metal about five inches down. I knew right away that whatever I had hit was bigger than a cut nail, and I was hoping for an ox shoe. I couldn't believe my eyes when I pulled it out: I held a small gun in my hands! It was a Stevens Pistol - a single shot, .22, target pistol. It wasn't of emigrant vintage, but still exciting. In this same area Ed Bagne found a quarter dating to 1862. Although our work was on Forest Service lands, Richard and Orsola Silva have also worked with the private ranchers in the area. They have been very cooperative and interested in finding the Trail across their lands so they can protect it. 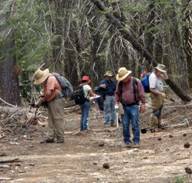 This PIT project proved segments of the 1852 Yreka Trail, and although some segments have been lost to logging, it can now be mapped and classified so it can be protected in the future.